American Honda Motor Co., Inc. today reported April 2014 Honda and Acura vehicle sales of 132,456 units—an overall increase of 1.1 percent (-2.8 percent based on the Daily Selling Rate, or DSR*) compared to April 2013. The Honda Division also saw an increase of 1.1 percent with April sales of 118,334. Acura division gained 1.6 percent on April sales of 14,122, with light trucks increasing 35.9 percent for the month on sales of 9,536 units. Year to date American Honda sales reached 457,810. In the first four months of 2014, Honda continued its retail sales momentum despite an environment punctuated by a handful of companies applying heavy incentives and a significant reliance on fleet sales. 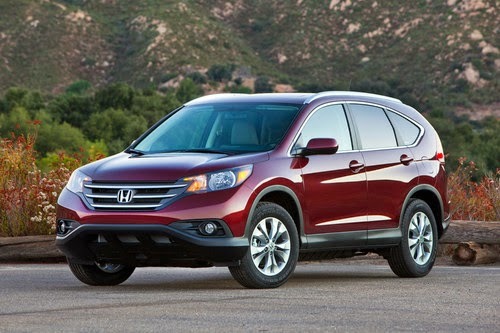 Honda enjoyed steady growth in April with CR-V setting a new sales record, and Accord and Civic enjoying gains. "After a few truly chilling winter months, it's great to see the warmer spring weather begin to liberate our customers and spark record sales of CR-V and solid sales results across the lineup," said Jeff Conrad, Honda division senior vice president and general manager. 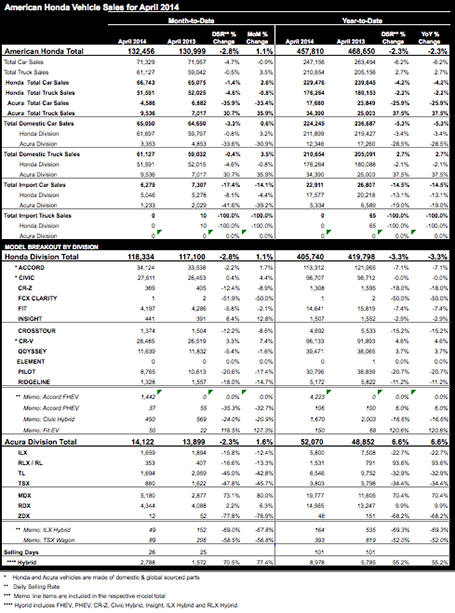 "More than any other automaker our success is based on one customer at a time going down to their Honda dealer to purchase a new vehicle, and in April, we see the power of our retail sales strategy at work." Acura light trucks continue to sell well above last year's pace, led by the hot-selling MDX and RDX. However, vehicle supply is becoming a factor as Acura begins winding down production of TSX and TL models in preparation for the new TLX models, which are scheduled to hit the ground later this year. "With RDX posting two solid years of continuous growth and MDX sustaining its hot sales pace, our Acura SUVs continue to set the standard in the luxury light truck segment," said Mike Accavitti, Acura division senior vice president and general manager. "In a few short months, we will unleash the all-new 2015 Acura TLX to reestablish Acura's reputation for thrilling luxury performance sedans and establish the Acura brand as a force to be reckoned with in the luxury segment." *The daily selling rate (DSR) is calculated with 26 days for April 2014 and 25 days for April 2013. Year-to-date, the DSR is calculated with 101 days for 2014 and 101 days for 2013. All other percentages in release are unadjusted; see table for adjusted DSR figures.